Los Angeles - Attorneys for two brothers injured in a head-on collision with a semi-truck asked jurors to award them millions of dollars, including punitive damages, at a trial that is currently underway in California state court. Michael Lennig, 39 and Matthew Lennig, 29, were driving north on State Route 14 in in July, 2014 when a southbound semi-truck driven by Hector Contreras for CRST International, an Iowa-based freight company, crossed over to the oncoming lane and slammed into them. Contreras admitted responsibility for the accident, leaving jurors to decide only what amount of compensatory damages the Lennigs deserve and whether or not punitive damages are warranted. Attorneys for the Lennigs told jurors their clients’ future medical expenses alone will top $7 million, and that they will ask for many millions more for pain and suffering, arguing that the accident left Michael with chronic back problems and a traumatic brain injury, and that Matthew’s arm was so badly crushed he has undergone over 30 surgeries to prevent amputation. Defense attorneys maintain the Lennigs’ injuries are less serious than described, and that their attorneys are seeking compensation far in excess of a “reasonable” amount. The trial is being webcast live gavel-to-gavel by Courtroom View Network. 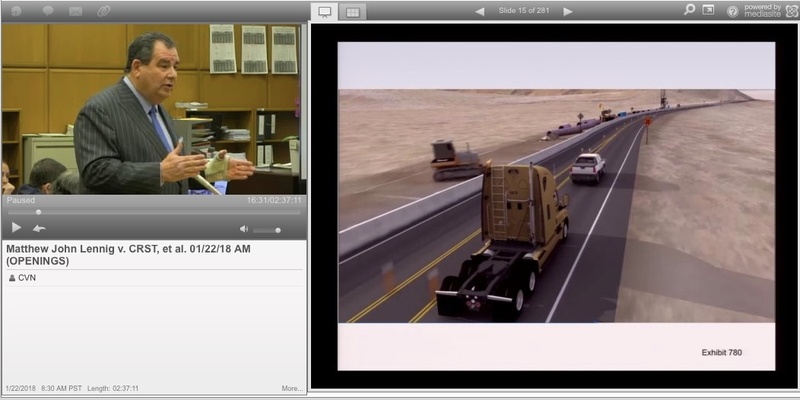 During his opening statement on behalf of Michael, Brian Panish of Panish Shea & Boyle LLP showed jurors a photograph of the Lennigs’ mangled pickup truck following the collision. “That’s what happens when you disregard the rights of others and you drive a large truck in the wrong lane, and these are the consequences,” Panish said. He told jurors that Michael, who works for the LA County Sheriff’s Office, will never get to live his dream of doing motorcycle patrols due to his spinal injuries. Panish explained that Michael is now limited to a desk job and struggles with chronic pain, along with the emotional side effects often attributed to brain injuries. Matthew’s attorney Rex Parris of the R. Rex Parris Law Firm walked jurors through the myriad surgeries he’s undergone to save his arm, which Parris said will never be restored to full functionality. Both attorneys made pre-emptive strikes on the defense arguments that the Lennigs are exaggerating their injuries, criticizing the defense team for secretly filming the Lennigs and allegedly relying on selectively edited video to disprove their claims. Representing Contreras, Fred Blum of Bassi Edlin Huie & Blum LLP stressed to jurors that the Lennigs have supposedly made “miraculous” recoveries from their injuries. “We don’t dispute that they should be compensated reasonably for the results of that accident, but that word ‘reasonable’ is going to be of critical issue here,” Blum said. He also denied the use of any selectively edited surveillance video to back up the defense case. He told jurors that there would be little difference between the defense arguments and testimony from physicians who actually treated the Lennigs, but that the trial would largely come down to a battle of expert witnesses. “The dispute comes when you get into the paid people, the people who are being paid to have opinions.” Blum said. The trial is taking place before Judge J. Stephen Czuleger in Los Angeles County Superior Court, and the full proceedings are being webcast and recorded gavel-to-gavel by CVN. The case is captioned Lennig, et al. v. CRST, et al., case number MC025288.